It was during the recording of memorial inscriptions in St James’ churchyard that my attention was drawn to the large family grave of the Browne family. Several of the occupants seemed to have lived quite impressive lives. Beginning with Joseph Augustus Browne, a civil engineer who whilst working on the building of the Southend – Tilbury railway liked this part of Essex so much, he bought Reeds Hill farm and settled there, also his wife Emma the daughter of Jonathan Wood. There was the Rev William Lawton-Browne, rector of Witham parish for many years. 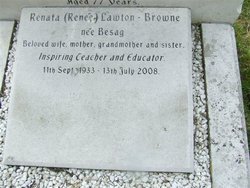 Renata Lawton-Brown’s memorial describes her as an “Inspiring teacher and educator”, as her work continues to this day I shall tell her story. Renee Besag was born in Berlin in 1933, after Hitler came to power the family were obliged to flee to the Netherlands and later, in 1939 to Australia. On leaving school she followed in the footsteps of her mother and found her vocation in teaching. Renee had many great stories of her first teaching posts in the outback in ‘Educational Priority Schools’, (‘slum schools’) and ‘Bush Schools’, where the parents were regularly responsible for clearing the snakes out of the children’s playground. In 1960 Renee gained a scholarship to the Albert Schweitzer College in Switzerland. It was here that she met William, they married in 1962 and settled in London. Her interest in dyslexia began when Mark, her first child was identified as having dyslexia. This little known condition meant that the search for a school which would address his specific needs was a long and tiring one. In order to gain a better understanding of dyslexia and to help other children like her son, Renee began her post-graduate studies in 1979 at St Bartholomew’s Hospital’s Dyslexia Unit, under the renowned Dr. Beve Hornsby. After leaving she approached the ILEA (Inner London Educational Authority) to start a dyslexia unit at the primary school where she was the Deputy Head (Duncombe Infants Primary School in Islington). She was told it would not be possible because it was not a recognised condition. This gave her the impetus she needed to start her own Hampstead Dyslexia Clinic and Centre for Learning Difficulties in the autumn of 1984. The clinic evolved from one teacher, to a staff of 25 over the years, and Renee worked tirelessly, teaching children of all ages, as well as training the next generation of therapists with her wonderful skills of gentleness and enthusiasm. Renee felt an incredible responsibility to give her all to those less fortunate than herself. 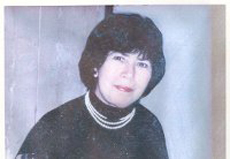 Sadly she passed away in 2008, but her legacy carries on, the clinic being run by her daughter. Thank you for this lovely article on my mother, Val!